When the Arabs invaded Spain in the year 711 their civilization was just beginning, Mohammed himself had died in 632, and at that time his followers were simple nomads, who lived in tents, wandered about from place to place, and had little concept of architecture, literature or the arts. One of the commandments of Mohammed was that his true believers must carry their religion by fire and sword into the lands of the infidel. Islam thus was not only a religion but also a dynamic of action. This was the germ spark that resulted in the birth of Arabian civilization, which reached its greatest flowering in Spain in the cities of Córdoba, Seville and Granada, and left its indelible mark in the blood and culture of emergent medieval Spanish society. The Arabs were not great originators; they imitated readily, absorbed rapidly, fused esthetically whatever pleased them in the more civilized cultures that they encountered and conquered. They added to this fusion an element of lightness, sensuality, and elegance, which contrasted notably with the massiveness and dark power of medieval Christian civilization. Arabs had assimilated much of the best in Greek philosophy, Roman law and government, Byzantine and Persian art, Judaic and Christian theology. Moorish rule in Spain, though in ever-diminishing territories, lasted from 711 to 1492. After their first startling victory, the Moslem hosts pushed into the north, crossed the Pyrenees, and at Poitier, in southern of France met their first decisive defeat at the hands of Charles Martel in the year 732. This marked the limit of the advance of the crescent. From now on the Moslem empire would steadily decrease in size. According to Spanish tradition, in 722 A.D., years before the engagement in Poitiers, the Moorish army sent to subdue the Cantabrian mountaineers was defeated by the Asturian chieftain Pelayo, who is also regarded as the first king of Asturias. The vale of Covadonga is marked as the place of this legendary Spanish victory, so widely celebrated in song and story. In all probability it was merely a local skirmish in which the Moslem advance guard was repulsed by the hardy Asturian mountaineers. Nevertheless, the Moors did not seek further penetration into these wild mountains, and it was from this primitive nest that the Reconquest of Spain began. The heir apparent to the Spanish throne, in memory of Pelayo’s victory, has always been called the Prince of Asturias, much as the heir apparent in Britain is called the Prince of Wales. After the engagement at Covadonga the Moors swarmed into France and were defeated there. Then they commenced to fight among themselves. Almost half a century passed before they called a halt to these intestine bickering and settle down to the less exciting labor of government. But slowly order was restored throughout the peninsula and the new civilization began to take root and grow. It was marked at once by a gesture of tolerance such as the Christians themselves never shown. When they reached the city of Córdoba, the first thing they saw was the great Visigoth church of St Vincent which stood on the banks of the Guadalquivir (Great River) on the spot formerly occupied by a Roman temple to Janus. The Moslems neither defaced, destroyed nor took over the building. They bought half of it in order to have a place to hold their own service, but permitted the other half to be used by the Christians. Throughout the years, the building became a mosque that would rival any other in Arabia. One of the first things the Christian did when they conquered Córdoba in 1236 was to stone in most of the multiple entrances of the mosque and use it as a church. The center of the building was torn out and a large choir was placed there. Moslem rule in Spain was never like that of Rome, with a strong centralized government whose capital stood outside the peninsula. There was a normal link with Damascus, which was not completely broken until Abderrahman III in 929 declared himself independent and established the caliphate of Córdoba. However, Damascus was far away, and the Arabs were never as thoroughly organized or as efficient in government as the Romans. The empire in Spain, therefore, almost immediately took on divisive quality of its own. Except for relatively brief periods Moorish Spain was composed of several petty kingdoms, just as was the Christian part of the country to the north. The moors came to Spain without women. The first generation of Moorish soldiers all took Spanish wives, hence the second generation of Moslems were already half Spanish in blood. As time passed the original blood became very thin, and the children often learned to speak the language of their mothers. New waves of invaders came across the straits and the race mixing altered notably the physical make-up of the population, particularly in Andalusia. The intellectual pursuits of the Arabs in Spain gave them the unquestioned leadership of the medieval world in this regard. The Jews too, who had been bitterly persecuted among the Visigoth, flourished under Moorish rule and many arrived from the east to settle in Córdoba, which became the great center of Hebrew learning of the Middle Ages, and one of the most famous Hebrew scholastic centers of all time. Literature in both Hebrew and Arabic was cultivated under the Moors. By 850 many ecclesiastical writers were complaining that Latin was neglected, that even the church fathers and the Scriptures were no longer read. But there was also a third language widely used in the Moorish Spain: the everyday primitive Spanish of the Mozárabes. Indeed this language was probably the most widely spoken idiom of the streets. In 1085 the Christians captured Toledo, at the geographic center of the peninsula, and this victory is regarded as the most important event since the arrival of the Moors in 711. Confused and frightened, the Arab rulers decided to send an urgent call for help to the Berbers of Morocco. The call was answered and a large army of recent converts to Islam, the Almoravides, crossed the Strait of Gibraltar in 1086. The Almoravides were a fanatical Berber group who forthwith imposed their will on the fragmented Moorish dominions. Half a century later an even more primitive group of Berbers from the Atlas mountains, the Almohades poured into the country. Thousands of Jews and Mozárabes (Christians living in Arab territory) fled to the north and joined their coreligionists in the petty Spanish kingdoms. The invasion of the fanatical Almoravides and Almohades in the eleventh and the twelfth century sent many Jews scampering into the northern Christian dominions, where the Spanish kings treated them with general esteem and tolerance until the time of Ferdinand and Isabella. The Spaniards followed the Arab custom of utilizing Jewish physicians, scientists, tax collectors, judges, diplomats, and public officials. Oftentimes Jews collected the tribute which Moorish rulers owed to the kings of Christendom, and vice versa. In this case, as among the Moors, the Jews were neutral emissaries whose morality was trusted implicitly. There were three main centers of Arab civilization in Spain: Córdoba (756-1010), Seville (1010-1248), Granada (1248-1492). Each of these cities and regions in turn enjoyed its period of efflorescence and dominion. 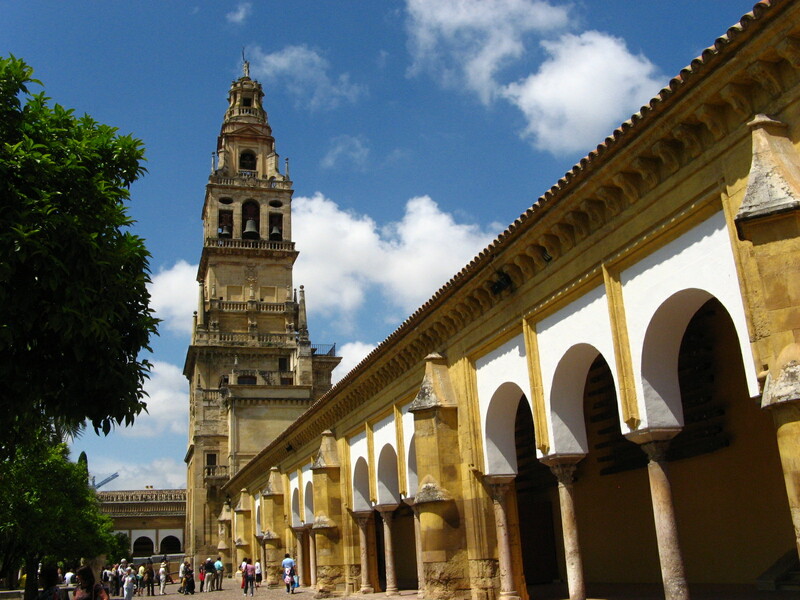 Córdoba was also the scientific center of Europe in the Middle Ages. The Christian kings and nobles who were gravely ill or needed an operation came to the physicians of Córdoba for treatment. Medicine, botany, chemistry, physics, mathematics, astronomy, geography, and Greek philosophy were but a few of the fields in which the savants of Córdoba excelled. The city of Seville had been a great center of the Roman Empire in Spain. For a time the city was the capital of the Visigoth, then Toledo replaced it and Seville declined in importance. When the Moors arrived they immediately began to build it up again. The defenses of the capital were also reconstructed. The ancient walls were repaired and new sections were added; numerous towers were erected to command the river. 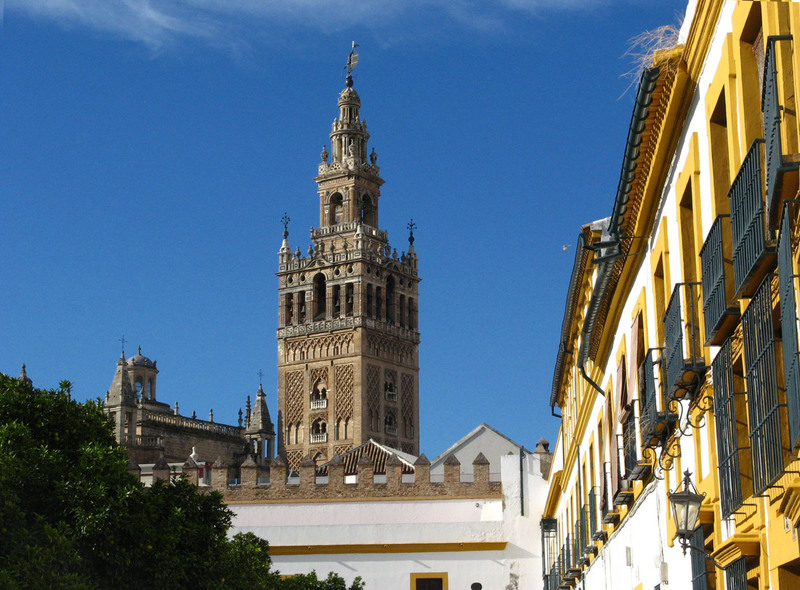 In 1171 the Almohades began the construction of their famous palace, the Álcazar, and their greatest architectural monument, the Giralda, said to have been designed by the man who invented algebra. This was the bright city which Ferdinand III, the Saint, surrounded with his large army of Christians in 1247. Seville did not fall easily. The siege lasted for sixteen months, and proved to be the most arduous and obstinately contested struggle of the Reconquest. The city of Granada today is perhaps the most beautiful in all Spain. Its geographical setting is unique, incomparable. Surrounded by the towering picks of the Sierra Nevada, the city itself lies in the midst of a green and fertile plain, called the vega. Water is still brought to the plain from the mountains, some of it still coursing along the ancient Moorish aqueducts. The word Alhambra means the Red Palace. It was begun around the year 890, and was greatly amplified around 1250. The ruling Moors of this region lived here until January 2, 1492 when Boabdil heaved his last sight and gave the keys to the city to Ferdinand and Isabella. For many years the Moors had paid an annual tribute to Castile in order to be left in peace, but in 1476 when payment was demanded, Abdul-Hassan proudly retorted: “The mints of Granada no longer coin gold, but steel!” The gantlet was down and the embattled city prepared for war. The Moors, apparently misjudging the spirit of the enemy, continued their tourneys, feasts, cane-tilting, music, and dances in a constant round of revelry. Grown soft and pleasure-loving in their mountain Eden, they were in the long run unable to withstand the onslaught of a hardier race. 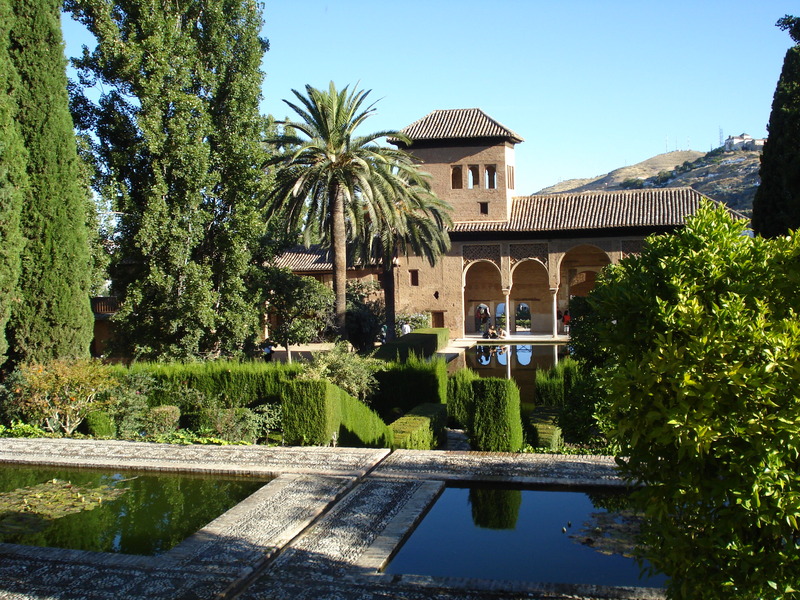 When the city was captured by Ferdinand and Isabella in 1492, the Catholic sovereigns were struck by the beauty of the place, and for some time thereafter held court within the palace of the Alhambra.